The Irish Pastoral Center is planning to organize a phone bank to flood the Senate and House of Representatives with calls in support of the Comprehensive Immigration Reform Bill. The IPC, which has a long history of working with the undocumented Irish, are hoping to do their part in the attempt to pass the reform bill which could provide a pathway to citizenship for thousands of working immigrants. The Immigration Reform Bill includes reform of the E3 Visa that would level the field for the Irish in terms of the quota of visas provided for each country. If the Reform Bill passes the Senate and subsequently the House of Representatives in it’s current state, a minimum of 10,000 visas would be available to the Irish on an annual basis. The IPC provides programs and services to meet the needs of the Irish community in Boston with free immigration clinics, legal referrals, pro-bono services and bereavement counseling. The centre receives numerous requests for support from those who have lost a loved one back at home in Ireland and cannot travel home to be with family. Having witnessed first-hand the challenges that face the undocumented Irish, the IPC are now looking to do their part in support of the Reform Bill. 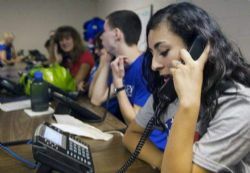 The proposed ‘phone bank’ is an opportunity for anyone who is in favor of immigration reform to have their voice heard by the House of Representatives. The centre is also encouraging anyone with friends or colleagues in New Hampshire or other neighboring states to help connect the IPC with their Senators and House Members for extra support. If you would like to get involved in the Phone Bank or to assist in any way, call the Irish Pastoral Centre at 617-265-5300 (Ext 14).